Sarah from our Soquel store is always coming up with the most fantastic and fun creations from items one would normally throw away, so we just had to share them with you. 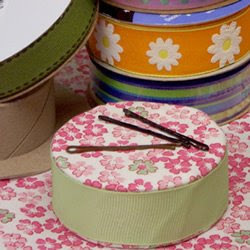 This is a bobbypin holder made with a ribbon spool, magnets, some fabric and ribbon. Using an empty spool of ribbon, take off the bottom, and trim the top. Glue a magnet to the the top of the spool. Cover with fabric and attach with fabric glue or mod podge and add a piece of ribbon. See? Super easy!